In this article, you will learn about the view templates, template file naming, ERB tags, and how to use ERB tags in HTML templates. I assume you have already read my previous article on Template Rendering and Redirecting In Ruby on Rails. Now, you will learn about the View templates, naming of template files, ERB tags, and how to use ERB tags in HTML templates. We will learn all this via two examples in this article. 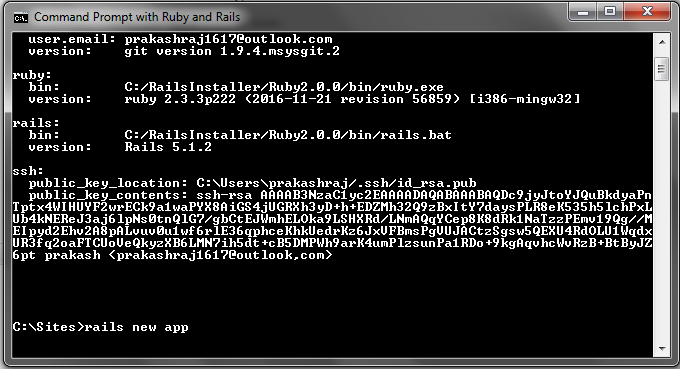 Software - Ruby on Rails installed on your system. Now, let's see the View templates. We will use HTML tags in Rails. HTML tags provide static web pages only but ERB tags give us dynamic information in that HTML template. 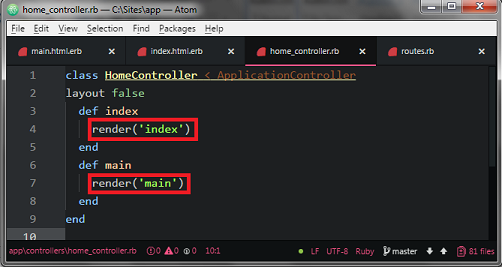 To view the template file, go to Rails application >> app >> View>> Home folder where the templates files are available. The template is named home, it is going to process with our ERB function and it completes with the final output format in HTML, this is the default template naming system in Ruby on Rails. 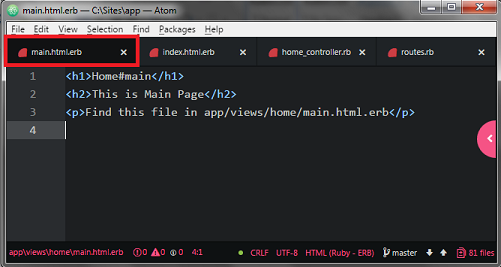 ERB is short for “Embedded Ruby”, the eRuby templating system will allowed inside embed ruby our HTML pages. This ERB tag is very important tag in Rails without this tag rails is nothing it will used to create variable, conditions statements, array and event works in this ERB tag it will show our static HTML page into dynamic HTML web page in browser. <% code %> - non output printing tag. <%= code %> - output printing tag. This expression tags are called non-output printing tags and they execute code and give output in yoru browser. We can see one text printing example for this tag in end of the content. <%# comments %> - it’s used to documentation work only. This comment tag is using for documentation purpose only it will not give output page in browser. Now we can see Two ERB tag examples one by one, I cannot explain ERB tags fully because this ERB tag is using an event, functioning only within Ruby on Rails. We are not using events and functions in this application, so I can’t explain fully in this article but I shal explain futher in an upcoming article. After opening the command prompt, let’s create a new application in rails using the following code. After put above the code in Rails command prompt some process going in there, we skip that process, if you have any doubt in application creation refer my previous article Creating application in ruby on rails. 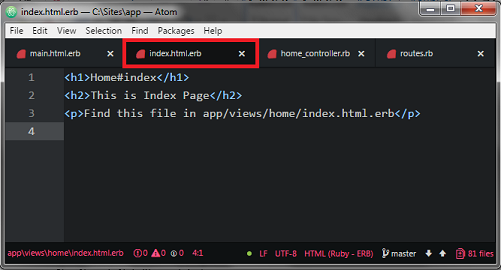 After creating the application open the application in our atom editor, now we just create one HTML file, in this example I name them main page and index page. Now we going to create our main page (main.html.erb) template in app>>views>>home folder. Open that folder now using the following code to create the file and then we will add some HTML tags. The index page file is already created in our controller generation, you can use that file (index.html.erb) in view>>home folder. Open that folder now using the following code to create the file and add some HTML tags. After completing the file creation now we have to configure the files in our home controller, The 'home_controller.rb' file is stored in our app>>controller folder and now we add rendering codes like in the following picture. This shows code for each page for rendering when the page requests to render it. 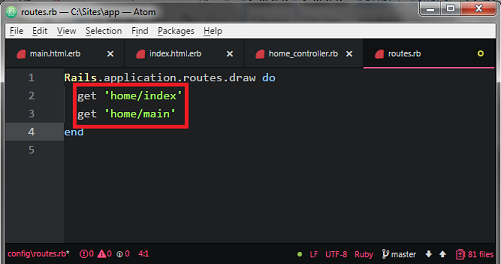 After configuring the HTML pages in the home_controller file the rendering process is complete, now we can add the route code in the route.rb file. The routing codes are added in route.rb file. To view the newly created HTML template files in our browser go to localhost:3000/home/main for the main page, and for the index page visit localhost:3000/home/index in yoru search bar. Before we open the template please confirm the rails server is ON, if not you can start it using this code in your Rails command prompt. Now we can see first example. before use create html file you should add end of extension ERB like this main.html.erb without ERB it will not working in Rails. Let’s add some text in ERB tag inside main.html.erb file the ERB code given below. The above code will create a target variable and assign the text ‘How are you’ in a non-out printing ERB tag. 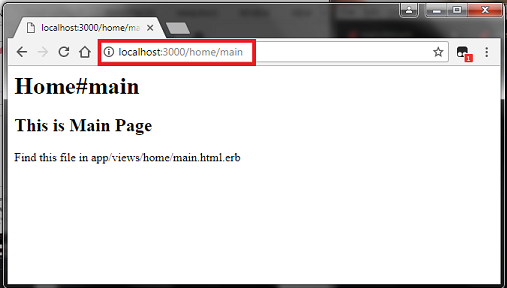 Now check in the browser by visiting localhost:3000/home/main. The EBR tag is working perfectly but not giving output in our browser page because we used a non-output printing ERB tag, so, it will not give output in the HTML template. Now we add the output printing ERB tag in the HTML template file.. The output printing ERB tag will show output in our HTML template because we used the output printing ERB tag. It will give output in HTML templates using an expression ERB tag. In this example we can use comment tag. This tag will not give output in the browser page. Use the code given below. 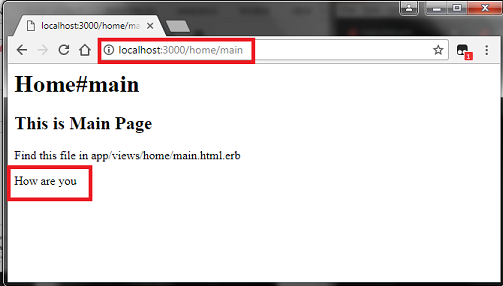 Now we check in our browser localhost:3000/home/main. The printing output tag will give output in the HTML page, but we changed that expression tag into a comment tag so that our ERB tag will not give output on screen, this is a ERB comment tag.